Tim Berners-Lee is a software engineer who invented the Internet (or the World Wide Web) in 1989 while at CERN, the European Particle Physics Laboratory. He is director of the World Wide Web Consortium that he founded and a Professor in the Computer Science Department at the University of Oxford. In 2001 he became a Fellow of the Royal Society and in 2004 he was knighted. Timothy John Berners-Lee was born in London on June 8, 1955. His parents were Mary Lee Woods and Conway Berners-Lee; he had three siblings. The Berners-Lee couple worked with the very first ever commercial computer, the Ferranti Mark 1 so you could say that computers were his legacy. He attended Sheen Mount Primary school then spent four years at Emanuel School in south west London. As a child, he was a very keen train-spotter and learned all about electronics through playing with his model railway. After his school years, Berners-Lee enrolled at the University of Oxford at Queen’s College for three years and received a first class degree in physics in 1976. After graduating Berners-Lee found employment as an engineer for Plessey Telecom located in Poole, Dorset and he worked on distributed transaction systems, message relays, and bar code technology. In 1978 he moved to D.G. Nash in Ferndown, Dorset which was run by two of his friends Dennis Nash and John Poole, where he created type-setting software for printers and wrote and a multitasking operating system. After he left CERN in late 1980, Berners-Lee became a Director at John Poole’s Image Computer Systems LTD in Bournemouth, Dorset. For three years he was in charge of the technical side of the company and gained experience in computer networking, graphics and communications software. In 1983 Vinton Cerf created the first commercial internet “email” system where information could be shared between individuals using email addresses. Berners-Lee, with his ENQUIRE proposal, wanted to devise a system that was automatically available to everyone. Berners-Lee returned to CERN in 1984 as a Fellow and by 1989 CERN was also the largest internet node in the European continent. Berners-Lee saw his chance to meld hypertext with the internet and produced his idea, Information Management: A Proposal”, in March 1989, to share information globally, without the need for emails. 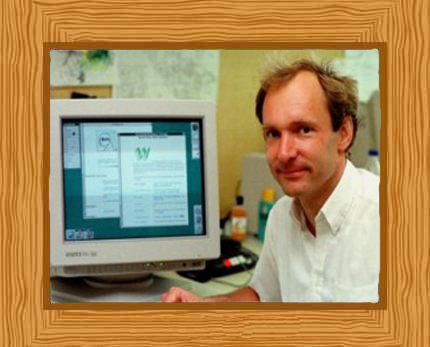 Thee system was named World Wide Web and Berners-Lee also designed and built the first web browser. The first website was built at CERN and was published on August 6, 1991; its address was info.cern.ch. and it acted as both a web server and web site. A NeXT computer located at CERN was used to run it. The first web site contained information about Berners-Lee’s project so visitors could learn about hypertext (HTTP) and learn about building webpages, so they could make their own. By 1992 there were 50 servers and by 1994 there were over 2 million users, with 150,000 new users being added every month. However the Web was still heavily in the academic field. In 1994 Berners-Lee founded the World Wide Web Consortium (W3C) at the Laboratory of Computer Science (LCS) at the Massachusetts Institute of Technology in Boston. It was made up of companies that wanted to work together to create Web standards and also improve the Web. It was quickly agreed that the technology should be free of royalties and patents. Berners-Lee has served as director of this W3C since it was founded. In 1995 Microsoft produced the first version of Internet Explorer and this commercial browser created enormous growth in websites and web users. The Web was first used for e-commerce in 1997. In June 2009, British PM Gordon Brown made the announcement that Berners-Lee, together with Nigel Shadbolt, would be working with the UK government so they could make data more accessible and open to people that needed it on the web site data.gov.uk. Berners-Lee holds the founders chair in Computer Science at the Massachusetts Institute of Technology. In 2016 he joined the Department of Computer Science at Oxford University as a professorial research fellow. Berners-Lee married Nancy Carlson, a programmer analyst, in 1990 and they had two children before they were divorced in 2011. He married Rosemary Leith, director of the World Wide Web Foundation, in 2014. In 2001 he became a Fellow of the Royal Society and in 2004 he was knighted. He was appointed to the Order of Merit in 2007. In April of 2009, the US National Academy of Sciences elected him as a foreign associate.